Felicia Bond (born Yokohama, Japan, 1954) is a writer and illustrator of books for children. She has illustrated If You Give… series. Her written works include Tumble Bumble and Poinsettia and her Family. Children could visit an interesting website at Mouse. John Glenn (born Cambridge, Ohio, 1921; died Columbus, Ohio, December 8, 2016) in 1962 was the first American astronaut to circle the earth. 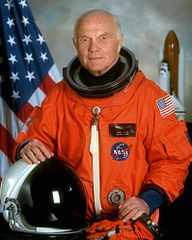 He traveled into space again in 1998 as a payload specialist on a shuttle mission. He was also a senator from Ohio from 1974 to 1999. Nelson Mandela (born Mvezo, South Africa, 1918; died Johannesburg, South Africa, December 5, 2013) was the son of a tribal chief. He became a lawyer and then joined the African National Congress. He was incarcerated for 28 years because he spoke out against apartheid. He was released in 1990, and he served as president of South Africa from 1994 to 1999. He received the 1993 Nobel Peace Prize. Jerry Stanley (born Highland Park, Michigan, 1941) writes books for children. His works include Children of the Dustbowl: The True Story of the School at Weedpatch Camp and Cowboys and Longhorns. Yevgeny Aleksandrovich Yevtushenko (born Zimma, Russia, 1933; died Tulsa, Oklahoma, April 1, 2017) was a poet and novelist. Nelson Mandela was inaugurated as president of South Africa in 1994. 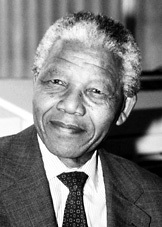 The anti-apartheid icon served until 1999 and died in 2013. Children can learn more at: Nelson Mandela.